A tribunal will take place to decide whether veganism is a philosophical or religious belief during a landmark legal case. Jordi Casamitjana has said he was sacked by the League Against Cruel Sports after raising concerns that its pension fund was being invested into companies involved in animal testing. He claims he was unfairly disciplined for making this disclosure and that the decision to dismiss him was because of his philosophical belief in ethical veganism. Mr Casamitjana's lawyers said ethical veganism satisfies the tests required for it to be a philosophical or religious belief, which would mean it was protected under the Equality Act 2010. 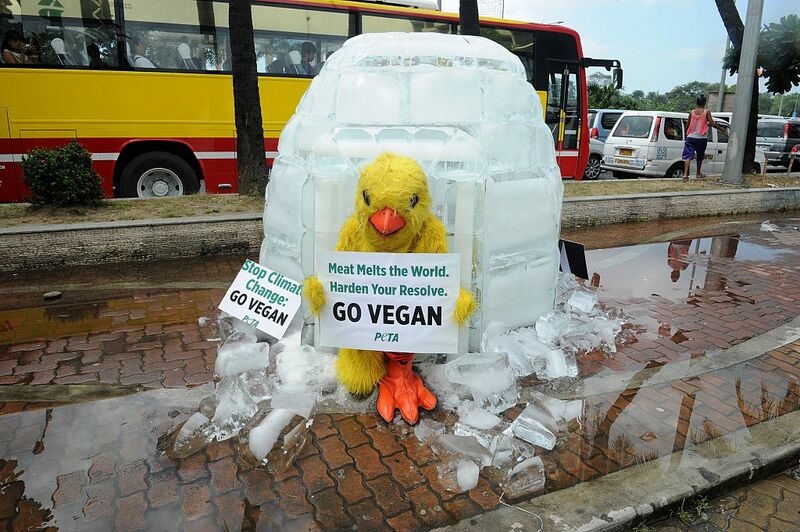 A member of People for the Ethical Treatment of Animals (PETA) wears a chicken costume while holding a placard which reads 'Meat melts the world', in Manila, Philippines in 2015. Bindmans LLP solicitor Peter Daly, who is acting for Mr Casamitjana, said ethical veganism "comfortably" met the tests needed to establish it as a philosophical or religious belief. He added: "Ethical veganism is more than simply a dietary choice. "It is a particular and well-defined philosophical view about the relationship between humans and animals. "It is based on well-considered and substantial philosophical thinking." Mr Casamitjana said the hearing was not primarily about his dismissal, but about establishing ethical veganism as a philosophical belief. He added: "Although the manner in which I was dismissed was intensely distressing for me, some good may come of it if I am able to establish this valuable protection for all ethical vegans. "If we are successful in that hearing, we will then proceed to a hearing on the specifics of my dismissal." The League Against Cruel Sports said it sacked Mr Casamitjana for gross misconduct and that linking the decision to his veganism was "factually wrong". In a statement to the BBC, it added: "Mr Casamitjana was dismissed from his position because of gross misconduct. "To link his dismissal with issues pertaining to veganism is factually wrong. "Mr Casamitjana is seeking to use his veganism as the reason for his dismissal. We emphatically reject this claim." Mr Casamitjana is crowdfunding his legal fees for the case, which will be heard in March next year.